SERIOUS Investing: Is there success in Success Transformer? A reader sent me a note on this company. I would have to admit, I am not too familiar with this company (as well as industry) which manufactures low voltage transformer and industrial lighting. I am a little bit attracted due to its low valuation and growth over the years to take notice. I believe there are many smart readers whom can dissect the numbers and provide some comments. While the growth is pretty consistent, few factors which are not so great are the deteriorating ROE, Debt / Equity although it is still very healthy. Free cash flow is not good. Price earnings as shown below is very low i.e. 4.61x. 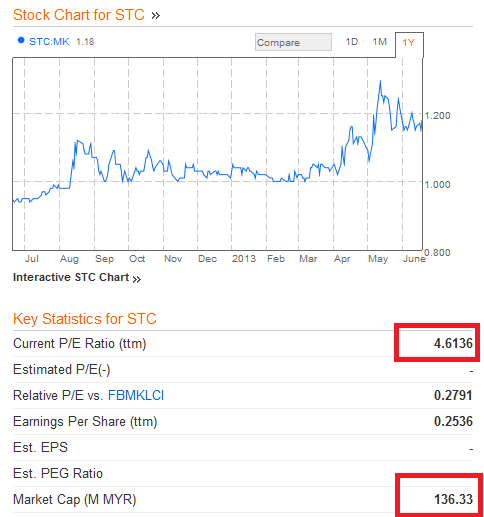 It is a very small company with market cap of RM136 million. 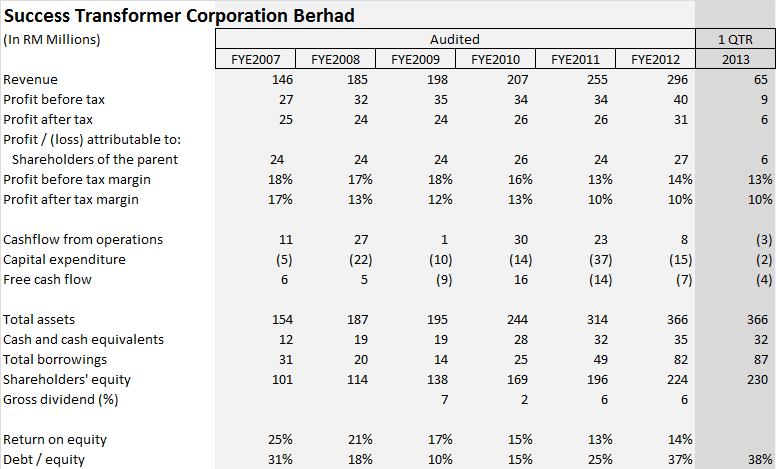 Under the group it owns 65% Seremban Engineering, another of its company which is listed in Bursa. I am not sure why it lists 2 such small companies in Bursa but probably for fund raising reasons perhaps. 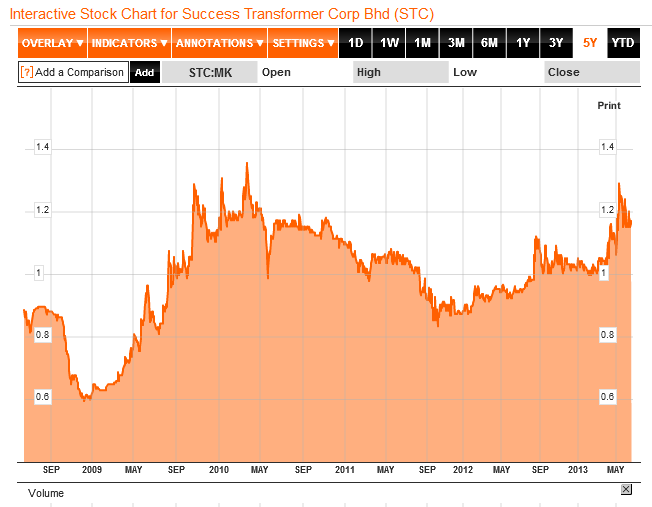 Success Transformer has a NTA of RM1.74 per share. It is trading at 0.68 price to book. It is an asset rich company with good cash flow. Success owns a 65% stake in Seremban Engineering which is into oil & gas fabrication and food processing. The major shareholder should privatise Success. Does anyone know what is happening in Success Transformer's subsidiary Seremban Engineering? The share price has been tracking up every day for the past week. Success is not so successful to me. This is due to its poor quality of its earnings. How poor is its quality of earnings? Very poor indeed. For example the average cash flow from operations for the last three years is only about 12 m compared to its net income of 28m, or just 43%. You say you made so much money, but where is the "money"? Show me the money! Worse, free cash flows have been negative every year for the last three years. So that is why its total debts has increased at a fast pace, from just 15m three years ago to 83m now.